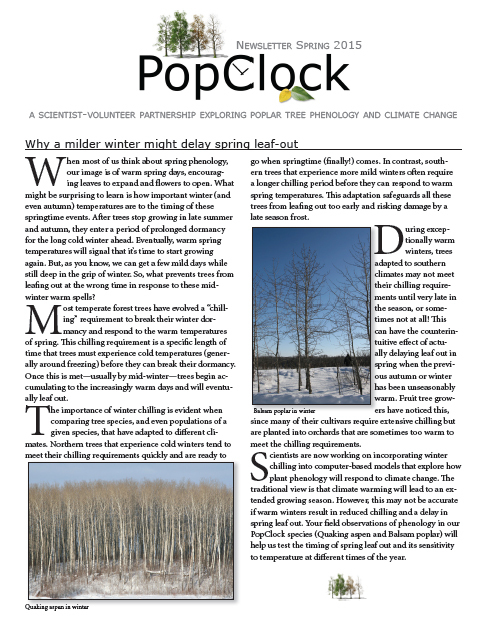 PopClock is a partnership between scientists and volunteers to study climate change impacts on poplar trees. With a grant from the National Science Foundation, a research team from the University of Maryland Center for Environmental Science (UMCES) Appalachian Laboratory is examining how forest trees are responding to rapidly changing climatic conditions. We have ended the phenology observation phase of the PopClock project. However, we still strongly encourage observations of these species of poplars, as they are part of our Green Wave campaign. As part of this effort, UMCES scientists worked with U.S. and Canadian volunteers to collect ground-based observations of spring leaf emergence and fall color change of two poplar species—balsam poplar (Populus balsamifera) and quaking aspen (Populus tremuloides). These observations are being used to create maps of “green-up” and “green-down,” which will be combined with genetic information to identify areas where trees are most and least adapted to climate change. What are the PopClock researchers finding? The PopClock researchers compared PopClock volunteers' ground-based observations of the two Populus species and continental-scale satellite imagery collected by the Moderate Resolution Imaging Spectrometer (MODIS). They found relatively high correlation between these two datasets (r2 = 0.67) but only after applying several data filters. Overall, these results suggest that citizen science and remote sensing observations can be comparable measures of phenology, though require significant data filtering. You can read more about these findings in an article recently published by the PopClock team in the journal Remote Sensing, or read our summary of this publication. The PopClock team also presented these findings at the Citizen Science Association in February, 2015. 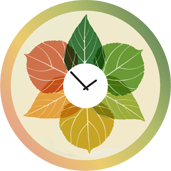 Watch our special PopClock Webinar that was recorded on September 9th, 2014. Learn how PopClock observations through Nature's Notebook can be used to 'ground-truth' satellite data. See more of what PopClock observations have revealed! Partners in this effort include the University of Maryland Center for Environmental Science Appalachian Laboratory, the USA National Phenology Network, Project BudBurst, and PlantWatch Canada. You can earn this badge by observing one balsam poplar or quaking aspen in six separate weeks, within the same year. See it on your Observation Deck.